Red Nails Audiobook. Source: Internet Archive. Wiki proclaims Howard as the "father of the sword and sorcery subgenre." You can read or hear (in audiobook format) Howard's original Conan works at the Internet Archive - see also here for the Conan stories that are in the public domain. You can read the Conan story Red Nails, with its original 1930s' illustrations, at Project Gutenberg. Red Nails was serialized in Weird Tales magazine from July to October 1936. Wiki: Red Nails confirms that Howard thought people have pretty much always believed that the end of the world is around the corner; the story "concerns Conan encountering a lost city in which the degenerate inhabitants are proactively resigned to their own destruction. Due to its grim themes of decay and death, the story is considered a classic of Conan lore and is often cited by Howard scholars as one of his best tales." Wiki also gives a list of other original Conan publications. Conan's love interest, Valeria, in a tight spot on the cover of Weird Tales (July 1936), first installment of the Red Nails story. Cover by Margaret Brundage. Image Source: Wiki. Conan with Bêlit in Queen of the Black Coast. 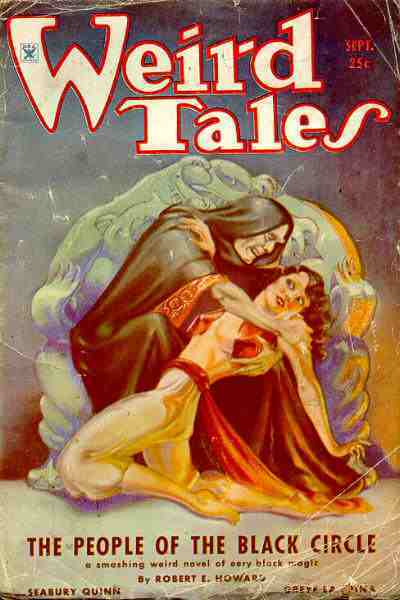 Cover of Weird Tales (May 1934). Image Source: Wiki. Another Conan story is Queen of the Black Coast, first published in 1934, which you can listen to in dramatized audiobook format below. Wiki comments that this story: "is set in the pseudo-historical Hyborian Age and concerns Conan becoming a notorious pirate and plundering the coastal villages of Kush alongside Bêlit, a head-strong femme fatale. Due to its epic scope and atypical romance, the story is considered an undisputed classic of Conan lore and is often cited by Howard scholars as one of his most famous tales." Howard's description of his prehistoric Hyborian Age is here. Queen of the Black Coast Audiobook. Source: Internet Archive. 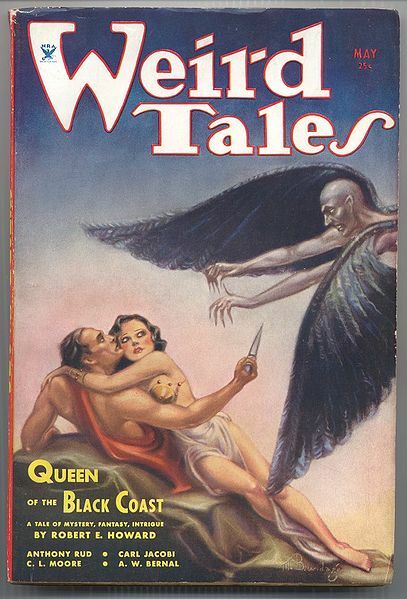 Weird Tales (September 1934) featuring The People of the Black Circle, the first of the late period Conan stories. Image Source: Wiki. Weird Tales (December 1935) featuring the first installment of the novel The Hour of the Dragon. Image Source: Wiki. As for the 1982 movie, it is one of the many memorable contributions Baby Boomers made to popular culture in the late 1970s and 1980s. Several of those contributions fell in the genres of fantasy and science fiction (another great venture that hails from this period is Elfquest). The 1982 Conan film was made by Boomers at their best, dreaming of Prehistoric days when human life expectancy was age 25. A Conan remake in 2011 proved that the first time 'round was better. 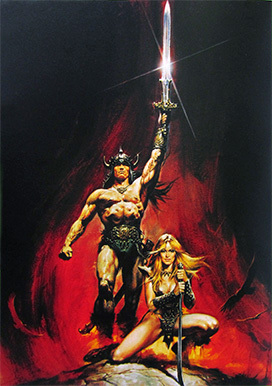 The Youtube link to the full 1982 Conan the Barbarian film is here. Embedding is not permitted, so you have to go to Youtube. For a paid link to see this film, go here. The free link will not last, so this is an ephemeral gift on the Web, whose copyright I do not own nor claim to own. This film is © Universal and 20th Century Fox (1982). The link is posted here under Fair Use strictly for not-for-profit educational purposes of debate and discussion. For my earlier post on Conan and Robert E. Howard's pulp version of Prehistory, go here.